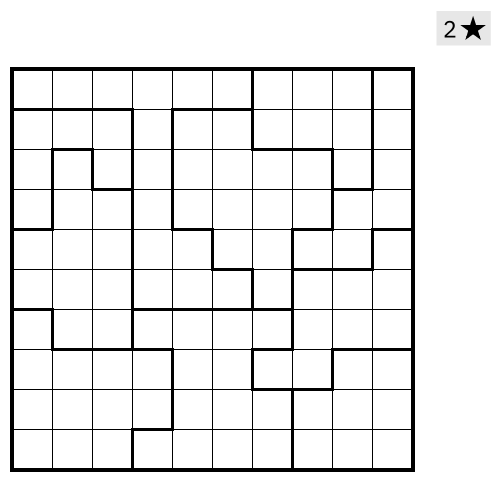 Here’s a practice puzzle I made for the German puzzle championships, which took place end of June. The puzzle is a Summawake, a variant of Heyawake that I haven’t seen before. I believed the competition puzzle (and the type) was due to Florian Kirch. It’s actually due to Ulrich Voigt! The instruction booklet has an example. 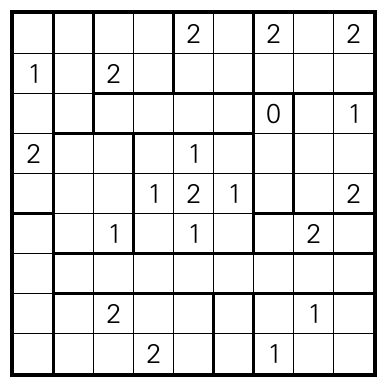 Rules Shade some cells, such that all unshaded cells are connected by edge, and that no two shaded cells share an edge. A horizontal or vertical stretch of unshaded cells may cross at most one area boundary. In addition, if there are any unshaded clues within an area, the number of shaded cells within that area must be equal to the sum of unshaded clues within that area. This entry was posted in Puzzles and tagged hard, heyawake, summawake, variant on 2015-07-26 by rob.